backtesting, trading simulator, forex tester, forex simulator, backtest, trade simulator, backtesting software, forex trading simulator, bacmes. Test trading strategies on 15 years of free historical data, dismiss losing methods, discover the systems that can provide you with profits in future. - Grow confident in your strategy so you can keep a clear head, act immediately on trading opportunities and avoid mistakes when you trade live later on! - Become an experienced and successful trader in less time! How does it work? Forex Tester simulates the Forex market with unequalled realism. You can test strategies and train your trading skills on (simulated) years of data in just a few hours (real time). Our strategy tester works with the recorded price movement of the real Forex market (15 years of historic price data). Like a recording of music, you can jump forward, pause or jump right to the interesting moments. You can go back to any point of time within the recorded price data and if you have saved a testing session (project) before, you can also restore all your open trades, trade history and account balance (of your simulated broker account) at this moment of the simulation. Statistics reveal true performance: You can take notes on every trade (keep a trade journal) and export your trade log for analysis on Excel or other programs. Theres no longer any need to rely on estimations, or even on wishful thinking! Amateurs have to rely on assumptions and believe what others tell them. Professionals, however, make their decisions based on facts. Forex Tester will deliver the hard facts about your strategies. If a strategy is not profitable, you will find that out quickly with Forex Tester (contrary to testing in a demo account). Now you can improve it or invest time in developing another strategy. Likewise, if you have a great strategy, you will want to trade as soon as possible. Forex Tester delivers the results you need to do so with confidence. 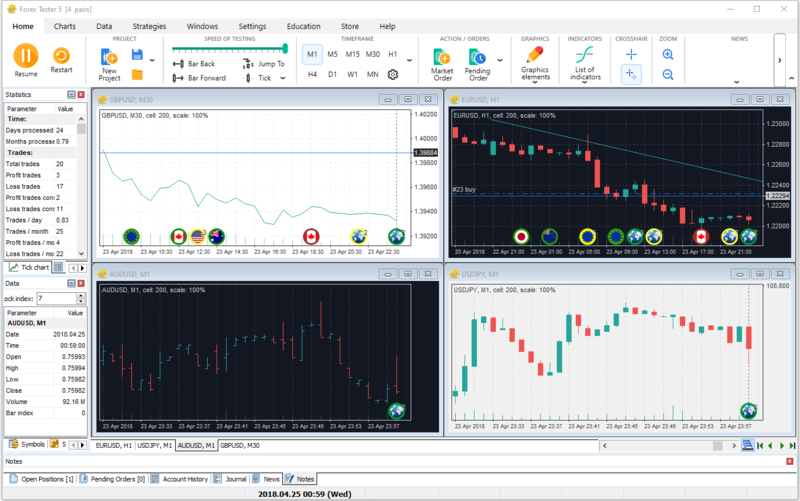 - Simplified mode system; - Automated ticks generation; - Any number of simultaneous currency pairs for downloading; - Profile (desktop) saving; - Automated time shift for all of the project's currency pairs; - Use the software on multiple monitors. Sys requirements: Compatable with: Windows 2000, 2003, XP, Windows Vista, Windows 7, Windows 8/8.1 и Windows 10.